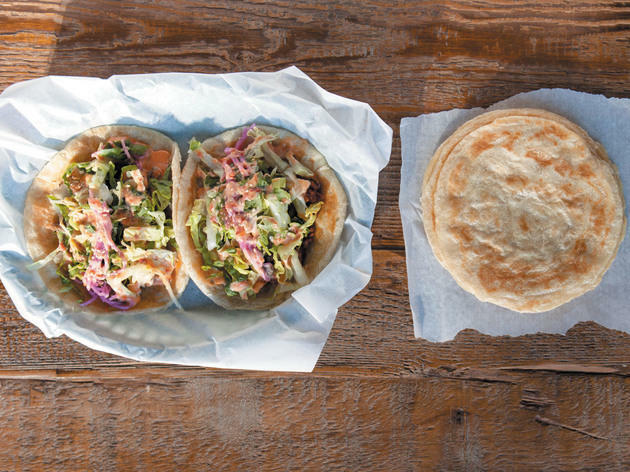 Korean tacos are old news, but they feel fresh again at this delightful Korean-fusion spot, where Indian-style parathas replace masa tortillas to unexpectedly magical effect. There is more to En Hakkore, however, than these instantly famous bulgogi tacos: Bowls of bibimbap overflow with fresh vegetables and easily serve two; cups of milky, nutty Job's-tears tea provide a warm-up on cool nights; and a selection of packaged sweets, such as Pocky, will make anyone feel like a kid in an adorable candy store. El stop: Blue to Damen. Bus: 50, 56, 72, 73. This bibimbap will change your meal for the better. All of the colorful vegetables create wonderful texture, the meat in both the beef and pork versions is tender, and the rice is never gummy or dried out. The portion is huge for what you pay, so it's a great way to stretch your cash while still getting a fulfilling meal. It's never a bad idea to get a few paratha to go alongside, either. This is one of my top Korean places to go in the city! Its the perfect mix of contemporary and traditional Korean dishes, with inventive twists on classics. Definitely get the paratha tacos with bulgogi, the portions are generous at a perfect price point. Their bibimbap is a more fresh take on the traditional version with loads of veggies. Even though they have a small menu, everything is on point with its flavors and quality. The decor is gorgeous and the service is always friendly/family oriented. This is a hidden gem! The best. I crave this daily. The service is always great and food always fresh. One of my go-to's for a healthy takeout option in Bucktown. I love their bibimbop! Who says that you can't go out to eat and have a healthy meal? The bibimbap bowls at En Hakkore is overflowing all the stuff your mother always told you to eat more of, from green veggies to crisp carrots. 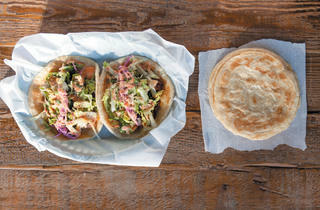 Everything at this small Bucktown eatery taste fresh and homemade, from the steaming rice to the grilled meat. Come hungry—the portions are large, but everything so so good that you probably won't notice.